Food, art, architecture, wine, coffee, fashion - Italy does it all extremely well. It is also blessed with stunning natural beauty. Visiting Italy is all about immersing yourself in the Italian spirit of living well. Don't rush around ticking boxes. Ponder, touch, taste and enjoy! The best places to stay in Italy are invested with this spirit of living well, so be prepared to be looked after in lovely surrounds. The 'Eternal City', Rome has been a place of pilgrimage since the Middle Ages, both for those journeying to the headquarters of Catholicism and travellers in search of beautiful art and architecture. Rome is home to a number of the world's great museums and art collections, but Rome's collections don't just fill the museums, they also decorate the piazzas and the public spaces. Some of the most incredible relics are the ruins of ancient Rome, the Colosseum, the Forum and the Pantheon. Naples with its incredible bay, views of Vesuvius is the birthplace of pizza and fashionable, beautiful, un-touristy Milan, are two of Italy's other great city break destinations. Naples is vibrant and frenetic rather than elegant and still has an impressive collection of Roman ruins, plus of course it's close to Pompeii and Herculaneum. Milan on the other hand has the world class sight and is also a financial capital. Then of course there's Florence, cradle of the Renaissance and for many the gateway to Tuscany. One of the world's most beautiful cities, Florence is packed with wonderful art and architecture on a grand scale. Michelangelo, Botticelli and Leonardo da Vinci have helped adorn the piazzas and palaces of Florence. Beyond the beauty of the city is the sunny, terracotta beauty of the Tuscan hills and Siena, Pisa, Montepulciano and San Gimignano. That's before you consider the natural beauty of the Lakes Region, the Amalfi Coast, Sardinia, the Cinque Terre or Capri. And the magic of Venice… It appears that the real challenge of planning your trip to Italy is choosing from too many incredibly promising destinations. Given that it's constantly a tourist hotspot, so be sure to book ahead if you want to guarantee yourself a room in one of the best places to stay in Italy. Rome's Colosseum is one of the country's most iconic spots, and rightly so. This wonderfully preserved amphitheatre oozes history and gives a real insight into how staggeringly advanced the Romans were. You're bound to be impressed by the Dumo di Milano's stunning architecture and glorious interiors. Head up to the roof terrace for a view of the whole city - just make sure to remember your camera! St Peter's Basilica, with its awe-striking architecture and magnificent artworks, is a must see even if you're not remotely religious. If you're on a romantic break then take a gondola at sunset along Venice's Grand Canal for an experience you'll never forget. Culture vultures will love Turin's Egyptian Museum, home to a wide variety of artefacts shedding light on Ancient Egyptian culture and history. As with many of the popular areas many of the best places to stay in Italy are snapped up so do make plans and book early. Five minutes from the Trevi Fountain, the Villa Spalletti Trivelli is a noble Roman townhouse renovated to perfection. The 12 rooms are classical, tranquil and aristocratic, and you're in a beautiful neighbourhood, surrounded by lush gardens. The Hotel Regina is an Art Deco extravaganza on the Via Veneto. 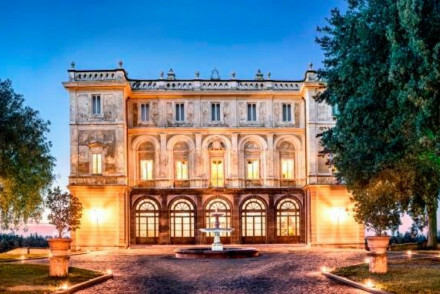 One of Rome's original grand dame hotels, this is an opulent spot, but with all the mod. cons. Capo d'Africa is a sleek, contemporary hotel with a gorgeous roof terrace directly overlooking the Colosseum. As well as being right in the heart of things, you're staying somewhere with retro style, as well as an excellent gym, restaurant and bar. Right beside the Spanish Steps, Crossing Condotti has just six rooms, filled with well chosen Baroque antiques, tasteful art and enormous beds. Central and romantic. Mario de Fiori 37 are a collection of sleek and modern self-catering rooms and suites located right near the Spanish Steps. You'll find every comfort and modern gadget you, or your family, might need. Milan's Straf was declared Italy's most avant-garde hotel when it opened and it's still creating a stir today. Come here to rub shoulders with the fashionistas and designers et al who love the interiors, where rough slate sits alongside burnished brass, iron and concrete. Also in Milan, Bulgari is more about understated glamour. Here the emphasis is on chic sophistication. Plus it's the only hotel within the city walls to boast a garden. A sensational spa and great food complete the picture. 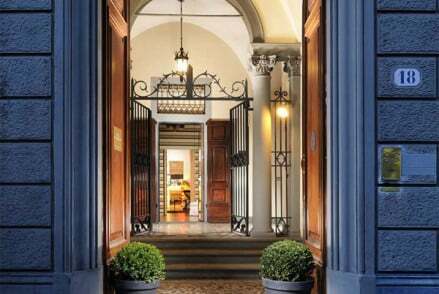 The Palazzo Niccollini al Duomo in Florence is a fabulous property, choc a block with original features and furniture, in an unbeatable location. Family owned and run, it's a spectacular residence overlooking the Duomo. Also in Florence, the Hotel Savoy is a fine, luxury hotel in the very heart of the centre, close to the Duomo. Styled beautifully by Olga Polizzi, this is a haven of pale and perfect luxury. The Grand Hotel Vesuvio is a Naples classic, with immaculate service and luxurious facilities right on the seafront. They also have a private yacht and chauffeur driven Daimler on hand if you need them. If you're looking for small and elegant in Naples, try Palazzo Alabardieri, a converted 18th century palazzo in a chic shopping area. The Gritti Palace is a classic grand hotel and our ultimate favourite of the many places to stay in Venice. The former Doge's Palace is traditional with heart-stopping views. Re-opening after a refurbishment which we trust will only have burnished its loveliness. Suite Sistina's ten rooms are perfect for honeymooners, with their oversized, glass sides showers, luxurious bathtubs and giant round beds. You're also staying in a beautiful building just metres from Rome's Spanish Steps. The Grand Hotel Parkers has a stunning, hilltop setting above Naples, while inside it's all understated neoclassical elegance with ornate ceilings and glamorous decor. The really special views can be seen from the roof terrace. The Grand Hotel et de Milan is a 'grand dame' with bags of luxurious character - think rich fabrics, antiques and fine art on the walls. It is also only a stone's throw from La Scala so ideal for opera buffs. 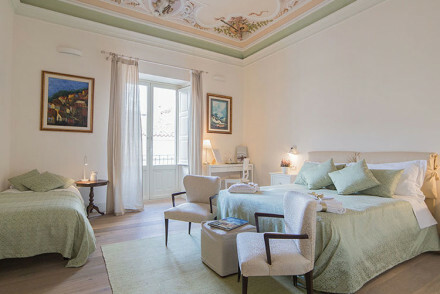 Florence's Residenza d’Epoca occupies the upper floors of a private house on the edge of the Piazza della Signoria and there are few rooms with a better view than these ten. Traditional, unfussy decor focused on heritage and comfort, and an excellent breakfast. Built in 1517 to be used as a convent, Loggiato dei Serviti is one of the most prestigious historic residences in Florence. Add to this its views across the Piazza SS Annunciata to Brunelleschi's Ospendale deli Innocenti, the charming antiques, rich fabrics and parquet floors. A carefully restored 15th century townhouse, L'Antico Pozzo is one of the few places you can stay in San Gimignano itself. It's been romantically decorated with four poster beds, ethereal drapes and wonderful frescoes whilst the views of the town are a one off. The Grand Hotel Continental is Siena's grand dame, dripping with priceless antiques and marble galore and boasting sumptuous rooms, floor to ceiling frescoes and an unbeatable location just steps from the Piazza del Campo. The Royal Victoria in central Pisa is awash with beautiful antiques, and the roof terrace has wonderful views over the city. The Lido Palace on Lake Garda offers five stars worth of wonder right on the shores of the lake and at the foot of the mountains - this really is one of the world's most idyllic settings. Behind the Liberty style facade are sleek, contemporary rooms, an award-winning spa and a Michelin recommended restaurant. Il San Pietro di Positano is spectacular. Five stars worth of vaulted-ceilinged, private beach, private balcony, gorgeous infinity pool and sumptuous rooms. And all with a view, of course. Hotel Santa Caterina in Amafli is luxury in a stunning spot - with a private beach reached by a glass lift with travels through the cliff face! 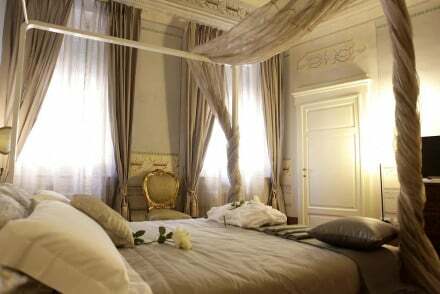 The Albergo del senato, just a short stroll of the Pantheon, offers elegant rooms and suites. There's a fabulous roof terrace and a traditional relaxed vibe throughout, despite the beautiful decor. 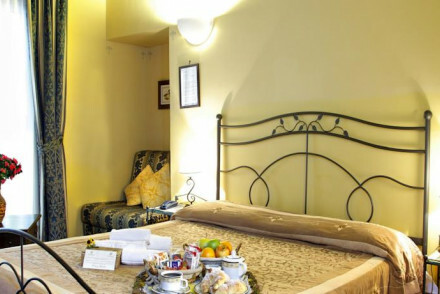 Also in Rome, the Locanda Cairoli is a comfortable, 15 room hotel close to the Piazza Navona. The gardens are beautiful and there's a feeling of sharing a private home rather than staying in a hotel. The Villa Rucellai is a charming 18th century villa on the outside Florence, surrounded by its own olive groves and grape vines. Another example of an old family home turned charming B&B, Rucellai has been home to the Rucellai family since 1740. Public areas are grand and homey, while the eleven rooms are simple and comfortable. Palazzo Ravizza in Siena is a 30 room pension which has been in the same family since the 1920s. Just outside the historic centre of town, the hotel is full of old world charm and elegance. Hotel Laurin, near Salò, is elegant Lake Garda glamour on the outside, and frescoes with Art Deco furniture on the inside - yet it's big enough, modern enough, and has enough of a garden and pool to be ideal for families. Villa La Tartana in Positano is perfect if you prefer a small hotel - there are just ten rooms and one family sized apartment, but its proportions are generous, just like the breakfasts served on the terrace. The Locanda di San Francesco is perfect is you want the wonderful flavours of Vino Nobile Montepulciano accompanied by the wonderful flavours of Tuscan food. Also near Montepulciano, Podere Dionara is stunning in that square, Tuscan way. This private spot produces its own wine and has a sommelier on hand for either a casual wine tasting or a more structured course. Lake Garda has always attracted those for whom money is not a problem, and, if you can afford it, the Villa Feltrinelli is a wonderful place to stay. Converted from a historic house, with superbly restored art and antiques, this house now offers Michelin-starred dining as well as its serene location. The Palazzo Avino oozes 1930s Italian film star glamour. Perched on a cliff overlooking fishing villages and pretty bays, this hotel is five stars from its two Michelin-starred restaurant to the open air gym. Localted in the hills above San Gimignano, Tuscany, Agriturismo Poggiacolle is a gorgeous farmhouse B&B as well as being a working vineyard and saffron farm. The rooms are 'rustic romantic' whilst there is an infinity pool and tennis courts, so it's far from basic, but there's plenty of room so it's also great for families. The Borgo Scopeto Relais is a chic hotel overlooking Siena. The large garden, with olives and oaksoffers amazing views, as well as two pools, a spa and tennis courts. The Tuscan restaurant is also a winner. The Hotelito Lupaia is a romantic, eccentric and luxurious eight room property in the heart of Montepulciano, with a lovely terrace and pool. The Palazzo Vecchietti is a distinguished 15th century built palazzo right in the heart of Florence. Dante called it 'Paradiso'. Now it's divided into fourteen luxuriously decorated suites and apartments, with lovely details like private terraces, high ceilings and amazing views. For a spot of understated luxury in the outskirts of Florence, book a room at the Villa San Michele. Converted from a 15th century monastery, it boasts glorious terraced gardens with breathtaking views over the city and a large pool. The Grand Hotel La Medusa is a mini resort with wonderful views over the Gulf of Naples and Mt. Vesuvius. Borgo Pignano is a palatial private estate outside San Gimignano. The bedrooms are huge, you breakfast in a ballroom and there's a private cinema, art and cooking classes, truffling expeditions and regular yoga sessions. Once a private palace, the Bellevue Syrene in Sorrento has been romantically refurbished so that it's now a palace for many, with rambling terraces, breathtaking views, marble floors, vaulted ceilings, private pools and a private beach. Converted from a monastery, there's nothing monastic about Monastero Santa Rosa Hotel & Spa now. The views of the Amalfi Coast from its perch on a cliff top are to die for and the hotel captures the essence of la dolce vita with the location, understated but immaculate style and incredible spa facilities. 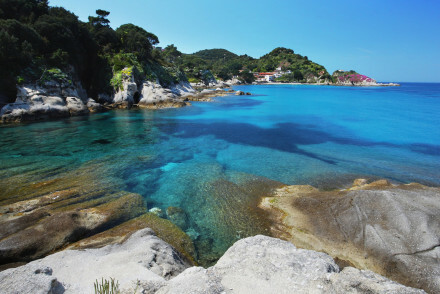 Italy's nicest weather-wise in the summer months, with the average daily temperature around 25°C in July. However, the mountainous regions will obviously tend to be colder than those on the coast. If you're here for the skiing then the season generally runs from early December to mid-April, but if you fancy seeing the sights it's best to come from June to September. This however is peak tourist season, so if you're looking for a quieter and cheaper alternative consider coming in May, September or October. There are a huge number of airports in Italy, with most medium to large sized cities having their own. If you're coming from the UK then the vast majority of flights will obivously be direct. Browse though our list of all the best places to stay in Italy. Expand your search to include our recommendations of all the best places to stay in Greece, Croatia or Switzerland. Luxury oasis near the Spanish Steps that marries modern décor with well-chosen baroque antiques. Five intimate rooms and one junior suite with original beamed ceilings, polished wooden floors, enormous beds and tasteful artworks. Elegant and chic, with a very hospitable concierge. 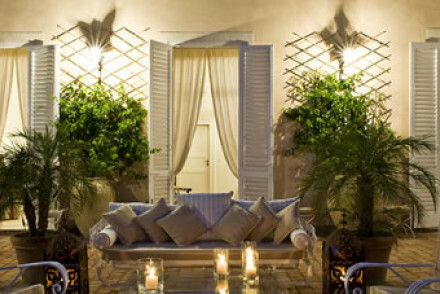 Luxury hotel outside Rome oozing simple elegance and history. Original frescos and Ciampelli paintings on walls. With a bar, restaurant and outdoor swimming pool, as well as access to spa and golf club. Value chic and perfect for a romantic getaway. A charming small hotel situated on Sicily's northern coast. Nine rooms offer a blend of contemporary comforts - a minimalist feel with white-washed walls and tiled floors - with traditional features, and some have private terrace. Large outdoor pool for lazy days and restaurant serving local dishes. Total relaxation - With just nine rooms plus a lovely outdoor pool and on site restaurant, you can enjoy a totally relaxing break. Great walks - There are lots of great walks and hikes in the surrounding countryside for all ages and abilities. Set in a renovated historic building in the gorgeous centre, this B&B boasts spacious, bright rooms with modern amenities while maintaining the original decor (including frescoes). Breakfast is served, there's restaurants on the doorstep, and it's mere steps from Urbino Castle and the Roman Theatre! Centrally located, contemporary B&B. Bright comfy rooms in whites and pastels. Excellent value for a weekend sightseeing in Rome. 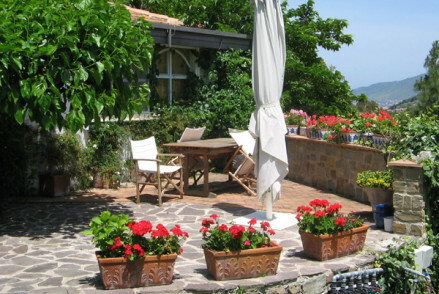 An utterly charming B&B in the Cilento National Park. Traditional chic rooms and a couple of apartments with private roof terraces. Luscious garden filled with lemon trees and the beach is reachable by foot. Excellent value for a beach holiday. Families - Some of the apartments sleep 2, 4, or 6. Sights nearby - Pompei,Ercolano,Sorrento,Positano Amalfi and Ravello are not far away. 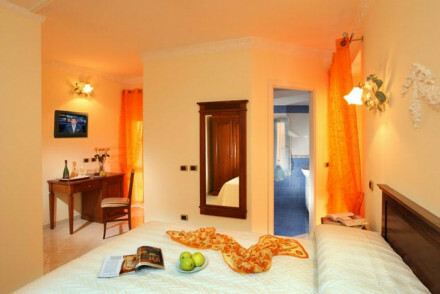 Warm and welcoming B&B in a lively area of Naples. Comfortable, traditional rooms and a small wellness area with sauna and hot tub. Enjoy Neapolitan pastries and good Italian coffee for breakfast. Local restaurants nearby and plenty to see on the doorstep. Great value base for exploring the city. Velona's Jungle offers just four luxurious suites all designed with a wildlife theme. 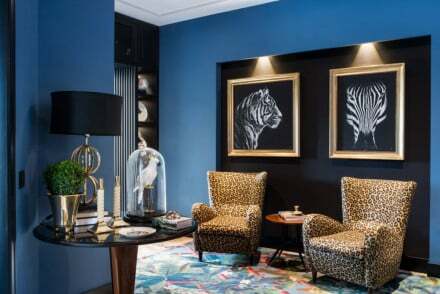 The decor is bold with animal prints aplenty, complemented by vintage objets d'art and antique furnishings. Located in an elegant residential neighbourhood, yet close to all the sights. Perfect for romantics. 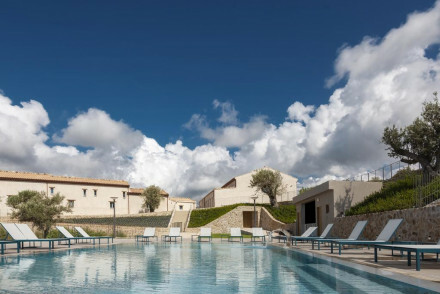 This boutique hotel is set in a refurbished sixteenth century farmhouse in beautiful Apulian countryside. Antique furnishings in simple but luxurious rooms add even more charm, and it has its own olive groves producing extra virgin oil. The perfect place to unwind. 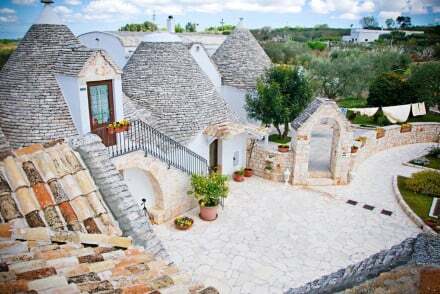 A glorious little trulli B&B with rock bottom prices and rooms that sleep 4. Picturesque white domed rooms, originally peasants' houses, have rustic chic interiors. 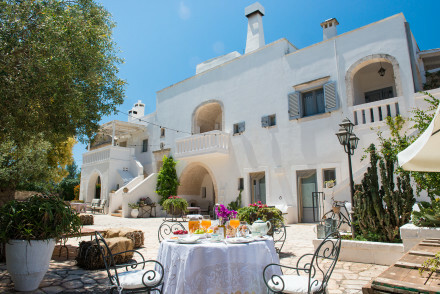 Lovely gardens and pool, and close to many attractions in Puglia. Perfect for families or groups of friends exploring on a budget. Families - 3 of the rooms sleep up to 4. Quirky - A unique trulli B&B. Steeped in 18th-century Italian grandeur, this is an elegant B&B located steps from the Leaning Tower of Pisa. Opulent rooms (the best of which have four posters) feature intricate cornices, large sash windows and antiques. Breakfast is served in equally grand surroundings. Fabulous!